Society is waking up to the importance of fathers but many men still do not know how to be the dad their child needs, according to newly crowned Western Australian of the Year Bruce Robinson. Professor Robinson, who received the State’s top honour on Saturday night, in part for his award-winning work with fathers, said children who grew up without a father or appropriate father figure were on average twice as likely to experience problems later in life. The problems could range from acting out in school to substance abuse and crime. Professor Robinson said many men did not appreciate the difference they could make in their child’s life. “A lot of dads just don’t realise how important they are,” he said. “They think have fun with kids, muck around, provide their private school fees, go and watch their soccer and maybe that’s it. “They don’t realise how powerfully important they are, how a kid has their radar out for what Dad thinks of them. Professor Robinson cofounded The Fathering Project, a University of WA-based not-for-profit initiative that aims to make fathers realise how important they are and give them the resources to be better parents. In addition to his work with The Fathering Project, Professor Robinson is director of the National Centre of Asbestos Related Diseases and has helped pioneer crucial research on detection and treatment of mesothelioma. He was awarded a Member of the Order of Australia earlier this year. Professor Robinson, who turned 63 yesterday and has three adult children, said he was honoured to be Western Australian of the Year. The glitzy ceremony at Crown Perth was hosted by comedian Rove McManus. The Western Australian of the Year Awards, formerly WA Citizen of the Year Awards, were renamed last year to coincide with the rebranding of Foundation Day as WA Day. Professor Robinson won both the overall award of the night and the business and professions category award. 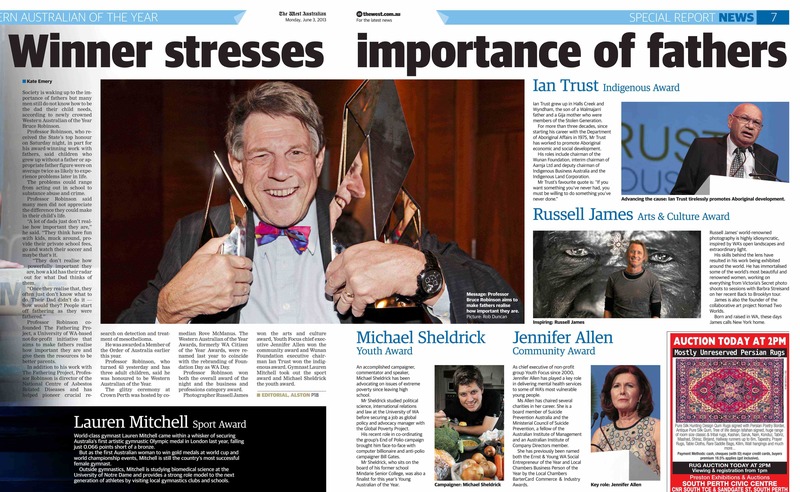 Photographer Russell James won the arts and culture award, Youth Focus Chief Executive Jennifer Allen won the community award and Wunan Foundation Executive Chairman Ian Trust won the indigenous award. Gymnast Lauren Mitchell took out the sport award and Michael Sheldrick the youth award. Mums play an even more important part in the family than usual when their partners are away for long stretches of time due to work or travel. Mums can help avoid resentment from the kids towards a dad who is often away and misses important events. Find out how by listening to this podcast. A short and funny clip featuring Peter Rowsthorn sharing a message on behalf of The Fathering Project.